Pit to Pit (Across Chest ): 23". Color: Red. Size: Large. Length (Top of Collar to Hem ): 27 1/2". Material: 100% Cotton. Team: Nebraska Cornhuskers Brand: Adidas Gender: Men Size: Medium Product: Short Sleeve, ClimaLite Performance T-Shirt with Screen Printed Graphics/Logos Material: : 100% Polyester Condition: New without Tags ~Please note that there is a slight flaw on the N on the shirt. Thank you. NEBRASKA HUSKERS long sleeve T-Shirt. Good Quality shirt, has extra Panels/Stitching on chest and shoulders. Not seen on basic T-Shirts. Good pre-owned condition. Nice shirt and saves you money! See Photos The shirt in the photos is the shirt you get. This shirt is 100% authentic BUY IT NOW. Nice t-shirt for a great price! (see photos) You will LOVE this item! This item is 100% authentic BUY IT NOW. 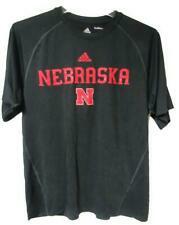 NEW adidas Nebraska Cornhuskers - Gray Cotton Short Sleeve Shirt (S) . Up for sale is a vintage shirt brand - Logo 7 tag size - no tag, fits like small pit to pit - 18" length - 25.5" condition notes - poor... hole in neck where tag was... ripped at sleeves... paint stains on bottom Vintage items may have shrunk over time and may not fit as described in tag size. Please compare measurements to your favorite shirt to ensure fit. Check out our store for more great items! Returns are gladly accepted for any reason within 30 days, but buyer may be responsible for return shipping cost and a restocking fee may apply. Buyer is responsible for any customs/import fees. Represent adidas and Nebraska. -Made of a Wicking Poly Fabric. Stain on Inside Bottom of Polo, and Stain on Outside Bottom of Polo. Light Fabric Mark on Back of Shirt. Small Stain on Bottom Side of Shirt. IMPORTANT INFO! 2ND SHIRT MUST HAVE AN EQUAL OR LESS ORIGINAL FULL“BUY IT NOW” PRICE. Nebraska Cornhuskers adidas Ultimate Logo Climalite Long Sleeve T-Shirt. Climalite technology conducts sweat and heat away from the body. Machine wash, tumble dry low. Material: 100% Polyester. Long sleeve. IT HAS A FANTASTIC HIGH QUALITY SCREEN PRINT ON THE FRONT 'FOOTBALL & CORN - THAT'S WHAT WE DO'. 8/10 no rips, holes, tears, or stains. I only say 8/10 cause it does show signs of wear. Mainly fading from washing and age, other than that a dope vintage piece from the 90’s. Embroidered name and logos. Size L fits true to size. Up for sale is a new Huskers polo shirt as shown. Please look at the photos carefully and if you have any questions feel free to ask. Thanks for looking and Good Luck!!! *NWOT* New without tags. No rips, holes, tears, or stains. Size XL. From the tags you can see it was manufactured in 2015 likely to represent former hustler QB Tommy Armstrong or can simply represent anyone. Overall a nice piece great for any diehard husker fan. FROST WARNING! This is a NEWUNIVERSITY OF NEBRASKA CORNHUSKERS shirt. 100% POLYESTER. This item is 100% authentic - BUY IT NOW!